A lot of stakeholders were involved in achieving recertification. 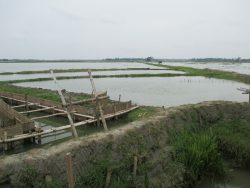 A new certification body involved (CU – since IMO stopped organic certification for shrimp) is always a bit of a challenge, but also for Blue Sea Aquaculture, the team who set up the internal control system, it was the first time they were in charge of coordinating the whole certification process, which was ordered by Shore. S.S. Seafoods, the company processing the organic black tiger from this project also successfully obtained organic certification.